We've all heard about the retail apocalypse and the supposed demise of malls. It's a familiar refrain: chains expanded too fast, and malls, especially in the mid-tier, are overbuilt and dying. E-commerce is eating into brick & mortar shopping. On the other hand, there are the counterpoints of what is actually thriving: more ‘experiential' specialty retailers and entertainment, for example. At Foursquare, we have a more holistic picture of shopping trends because we have the unique vantage of being able to observe the footfall patterns of millions of Americans as they visit all kinds of places throughout their day. No single mall operator, retailer, or investor has this type of overarching view. Foursquare is able to do this because of our first-party data combined with our partner network of data, and our ability to differentiate between malls and the venues inside the malls, making us the industry leader in analyzing foot traffic behavior everywhere — especially in hard to individualize places, like dense indoor, multi-story and shopping areas around the country. Today, we're looking at what happens to foot traffic when new venues open at American malls. 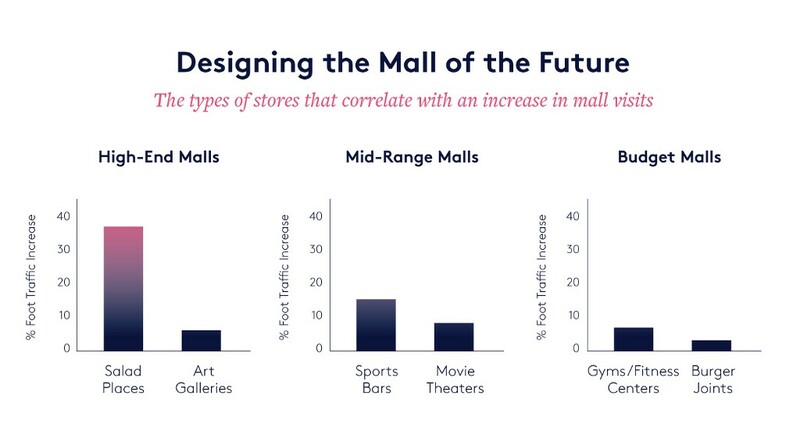 Our goal was to uncover what data says the “Mall of the Future" looks like. That's a question mall operators, developers, retail brands, restaurants, commercial real estate brokers, and analysts want to know. What we found: The most significant factor in the success or failure of a new retail location opening — whether it's a Warby Parker or a wellness center — is what we're calling “categorical fit." The trick to save a mall is opening venues that lure people in by complementing the existing ecosystem. We focused on the changes in foot traffic** to an entire mall when it opens a certain type of venue or specific brand retailer. The study included nearly 1,000 malls from the Foursquare Places database, including enclosed and open-air malls, but excluding strip malls, outlet malls, and malls with fewer than 25 venues. Methodology: Foursquare classified malls according to its own proprietary, algorithmic system that separates out the most high and low end malls from the rest of the spectrum. The system labels malls with a high index of premium and luxury chains as high-end; malls with a high index of discount/dollar stores and fast casual restaurants as budget; and all others, with a more balanced mix, as mid-range. 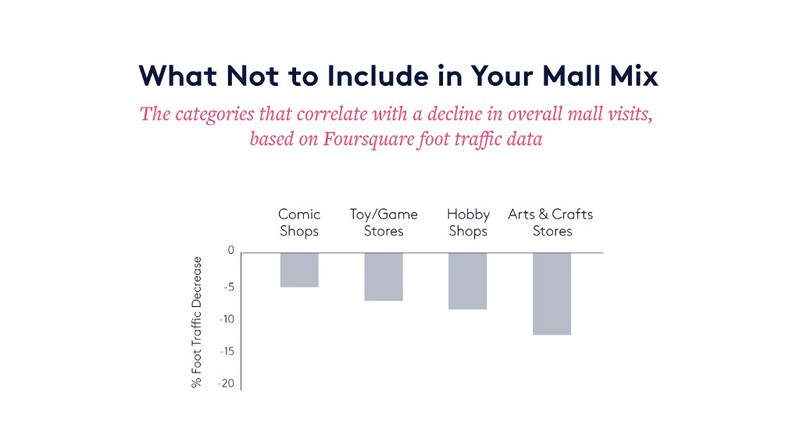 Foursquare studied malls with venues that opened in 2016 and 1H 2017, and followed foot traffic trends over the next four quarters, while correcting for seasonality. 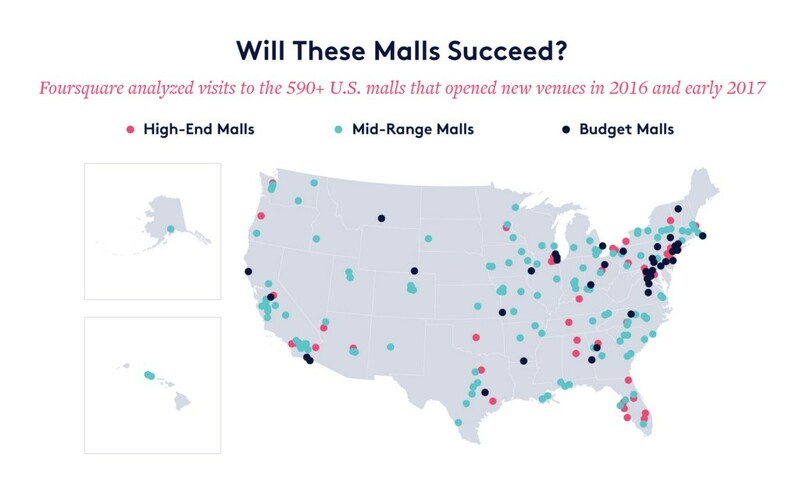 We studied malls with venues that opened in 2016 and followed foot traffic trends over the next four quarters, while correcting for seasonality. This approach allowed us to compare venues that opened in different quarters. Full caveat: While we found meaningful statistical correlations, we know that that doesn't necessarily indicate causation. Do arcades drive more traffic to malls? Or are arcade operators just good in picking malls growing in popularity? Perhaps there was an underlying third cause… We believe the opening may be causational in the cases where we've chosen to highlight trends or disclose the specific lift we've seen. Lastly, all of the above also took into account our usual normalization scheme (accounting for demographics and adjusting according to the US Census). Adding the right retailer or experience can boost the whole mall, but it has to be a “fit" for the mall context. We found this pattern emerge when we classified malls into three distinct categories — high-end, mid-range or budget. The same store categories (for example, apparel shops, department stores, electronics stores) perform in different ways depending on the class of the mall in which they open. Methodology: Foursquare's data scientists examined the foot traffic of a panel of U.S. users who have been active on the Foursquare City Guide or Foursquare Swarm apps as well as partner apps, and had visited a mall when it opened any type of venue in 2016 and 1H 2017. All data was pseudonymized, analyzed in the aggregate, and normalized against U.S. census data to remove any age, gender or geographical bias. At mid-range malls, bars (especially sports bars), movie theaters and arcades (most notably Dave & Busters) correlate with more visitors. For example, alongside the opening of the sports bar/bistro Hy-Vee Market Grille at College Square Mall in Cedar Falls, Iowa, we saw foot traffic to the mall nearly double. It's a different story in luxury centers. High-end malls get halo effects from venues like art galleries, activewear shops and salons/barber shops (and salad places; more on food in Tip #3). Additionally, brands that offer compelling in-store experiences are successfully attracting more visitors; examples of these include Peloton, Lululemon, and Warby Parker. For example, following the Warby Parker opening at the Domain Northside in Austin, Texas, the mall saw around 15% foot traffic growth in the following four quarters. At the low-end, it's gyms and fitness centers (and burger shops) that appear to bring people in. We know that Planet Fitness is doing well overall (as we noted after spotting early indicators of success through a 2017 Foursquare report), and we see the brand is performing well for low-end malls, too. One example: The fall 2016 opening of a Planet Fitness at Greenbriar Mall, in Atlanta, helped to drive a more than 10% increase for the entire mall footprint. Consistent with Tip #1, consumers have certain expectations when they visit a mall; for a new tenant to add to the overall health of the mall, it should land within the expectations of the existing consumer set and make sense for the ecosystem that exists. You won't be surprised to hear that restaurants generally do well for malls, but categories matter. Mid-range malls with typical retail stores such as Victoria's Secret and Aéropostale are best served with the addition of dining options that have traditionally attracted consumers for nights out: for example, seafood restaurants like Bonefish Grill. These types of places aim to encourage repeat visitors, and the stats are in their favor (for more on this, see our Casual Dining Loyalty index). Mid-range malls also do well with quick lunch spots, such as sandwich places and fast food restaurants including Chick-fil-A. The addition of at least one of these seafood and fast food dining options correlated with foot traffic increases of up to 10% in the nearly 75 mid-range malls with these openings during the time frame of our study. Foot traffic to high-end malls — with retailers like Apple or Saks Fifth Avenue — increases when they add food establishments that are healthy and trendy, such as salad places, Mediterranean restaurants, juice bars, Japanese/sushi restaurants and bubble tea shops. When these venues open, the malls saw increases up to 30% in foot traffic in the following four quarters. One great example of a success story is Tysons Corner Center, outside D.C., which had more than a 20% lift in foot traffic year-over-year, driven, in part, by a major ongoing renovation/expansion that included the opening of a Sweetgreen salad shop, Kung Fu Tea bubble tea shop and Jinsei Organic Juice Bar. The single venue type that has correlated universally with increasing foot traffic to malls, including those on the low-end, is burger joints, attracting 5% more shoppers on average. For all mall categories, burger joints like Red Robin, Johnny Rockets, and Shake Shack (and plenty of independent burger restaurants, too) are a draw that seemingly put people in the mood to stay and shop. Tip 4: Avoid hobby shops and keep a close eye on apparel. Looking across all shopping malls within America, there are a few categories that universally correlate with lower foot traffic once opened. These include comic shops, toy/game stores, automotive shops, and arts & crafts stores. This may be because these categories are more affected by e-commerce, with less need to test items out in person or try them on. We also see that mobile phone shops have a negative effect (even though mobile phone purchase and subscription overwhelmingly remains in person at stores). These categories may not add to the ambience of the mall in various ways that are hard to define. If you're wondering about clothing, most major apparel categories — department stores, women's stores, men's stores, boutiques, clothing stores and shoe stores — show inconclusive data: for some malls they are the right fit and correlate with higher visitor numbers, for others, it's the opposite. It's safe to say that these categories as a whole are not “sure winners" in any mall type, and it depends on the local situation. We're optimistic about malls opening lifestyle centers and other experiential elements such as luxury apartments and co-working spaces, like Bespoke Coworking at Westfield San Francisco Centre, which correlated with a more than 15% increase in foot traffic. Yet while there are many examples of these types of experiences aligning with a boost of mall traffic, it's impossible to give a one-size-fits-all recommendation here. Our opinion is that these new tactics may be very lucrative options for certain malls, but they need to be strategic endeavors that consider all factors including general mall health and other broader neighborhood assessments. Or do what Triple Five Group, the developers behind the Mall of America, just announced: the company's $4B mega-mall is slated to open in Miami, Florida with a water park, ski slope, and over 1,000 stores. Let's hope they get the mix right. To measure mall traffic with Attribution, attract and reach customers with Pinpoint, and uncover deeper insights, more granular metrics and other marketing strategies informed by location technology, visit us at enterprise.foursquare.com or email ads@foursquare.com. **Foursquare's data analytics and insights team examined the foot traffic of a panel of U.S. users who have been active on the Foursquare City Guide or Foursquare Swarm apps as well as partner apps. All data was pseudonymized, analyzed in the aggregate, and normalized against U.S. census data to remove any age, gender or geographical bias. We classify malls according to our own proprietary, algorithmic system that separates out the most high and low end malls from the rest of the spectrum. The system labels malls with a high index of premium and luxury chains as high-end; malls with a high index of discount/dollar stores and fast casual restaurants as budget; and all others, with a more balanced mix, as mid-range.